March 1st-Title action in Thailand and Tournament final in Korea! March is set to be an amazingly busy month, and there is no delay as we kick off the month with a WBA Minimumweight title fight. That fight will see defending champion Knockout CP Freshmart (14-0, 6) battle against Japanese challenger Go Odaira (13-5-3, 1), with Odaira looking to secure a world title in his third world title shot. The unbeaten champion, who had a great 2016 with wins over Carlos Buitrago, Byron Rojas and Shin Ono will be looking to make his second defense of the title and solidify his standing as one of the elite Minimumweight. On paper this should be a straight forward win for Knockout who will likely be looking for bigger fish than Odaira later in the year. As well as the world title fight in Thailand there will also be a show in Seoul, courtesy of Boxing M.
The main event of the card will see the unbeaten Ji Soo Jung (3-0, 1) battle against Ma Roo Jung (6-4-1, 2) in the final of the Boxing M Welterweight competition. Interestingly these two men fought last December, with Ji Soo Jung taking a competitive 4 round decision over his foe, and he'll be looking to do the same again here in an attempt to extend his unbeaten record. The more experience Ma Roo Jung impressed last time out, when he destroyed Doo Hyup Kim, and will be looking to avenge his December defeat here. In a supporting bout we'll see Joon Yong Lee (5-4-4, 3) take on Gyu Won Lee (4-1-1, 2) in a 6 rounder. Although this bout doesn't look remarkable on paper it is worth noting that Joon Yong Lee holds a draw with OPBF Middleweight champion Koki Tyson, and in fact deserved a win over Tyson when the two men fought last year. Gyu Won Lee started his career 0-1-1 but has subsequently won 4 in a row to get his career on track. December 14th-World title action in Thailand! On Tuesday Japanese fans will get a trio of female title fights at the Korakuen Hall. Just a day later attention turns to Thailand where we get a male world title fight, and continue to move towards the really end of year bouts. That title bout will see WBA Minimumweight champion Knockout CP Freshmart (13-0, 6) take on Japan's Shin Ono (19-7-3, 3). The unbeaten Thai will be fighting for the first time since unifying the WBA and WBA interim titles, back in June, and will be looking to end the year as one of the stand out Minimumweights. Whether he's the best in the division or not is open to debate but he's certainly in the mix thanks to notable wins over Nicaraguan pair Byron Rojas and Carlos Buitrago. Ono is best known for coming up short in an IBF title fight against Katsunari Takayamabut has gone 2-1-1 since that loss, with both setbacks coming at Japanese domestic level. It's hard to see Knockout losing here but it's good to see him in the ring again before the end of the year. On the under-card will be another Japan Vs Thailand bout as former 2-time world title challenger Go Odaira (12-5-3, 1) returns from March's stoppage loss to Wanheng Menayothin to battle Fahpituck Por Pakdee (6-1, 3). Odaira will know that anything but a win here could finish off his career which has failed to really live up to the potential it once showed. In Japan Misako will be putting on a lowl level card. The main event of the show will see Masajiro Honda (6-7, 4) battle against Shun Shimazaki (7-8-1, 2) in an 8 rounder. Both of these guys are struggling, with both having won just 2 of their last 6, but together they should make for a hotly contested and very interesting match up that should rovides some thrills for the fans in attendance. The popular Dangan series of shows returns this Tuesday for it's 11th edition. The show features 8 bouts in total and will be headlined by two title fights whilst also featuring a trio of B class tournament final bouts, all in all providing a very solid card. The show begins with a sole 4 rounder as debutants battle each other in a Light Welterweight bout. We've not been given the fighters names for this bout though with debutants colliding it's likely to be a competitive bout between two men hoping to record a debut win. The second bout on the show will also be a 4 rounder as the unbeaten Kamiya Haruaki (2-0, 1) battles against Keisuke Fujii (3-4, 2) in an interesting low level bout. The first of the three B tournament final bouts will take place at Light Flyweight as the heavy handed Daisuke Hayakawa (7-2, 6) battles against the tough but feather fisted Masahiro Ouchi (6-7). This looks like a mismatch on paper though could be an interesting test for Hayakawa. The second of the B class tournament final bout will be a Featherweight bout between the limited but experienced Yoshihisa Yokota (6-10-1, 2) and Kenji Fujiyama (5-3, 3). Sadly this looks almost as poor as the first bout B class bout. The final of the B class bouts is the best of the bunch as Yutaka Kamioka (7-3-2, 4) takes on the once beaten Gaku Aikawa (6-1-1, 1) in a very good looking Super Bantamweight contest. We have to favour Aikawa but only just and this is the sort of bout that we love to see thrown up in the B class tournament contests that Dangan put on. Following the B class bouts we get an interesting looking 8 rounder between two Japanese ranked Welterweights. The bout will see #5 ranked Moon Hyun Yun (14-4-2, 2) battle against #7 ranked Ryota Itoyama (10-5-1, 5) in what is effectively an eliminator for a Japanese title fight with the once beaten Suyon Takayama. Talking about title fights the penultimate bout on the show will be an OPBF female Minimumweight title fight between defending champion Saemi Hanagata (9-4-2, 4) and former 2-time title challenger Mika Oda (5-7-1, 1). Oda will be hoping this it third time lucky whilst Hanagata will be hoping to record the first defense of the title she won earlier this year. The other title fight on this show will see the world ranked Go Odaira (10-3-3, 1) defending his Japanese Minimumweight title against the once beaten Hiroya Yamamoto (8-1, 3). On paper this looks like a good bout though in reality it is likely to be a very one sided contest with Odaira much, much more proven than his challenger who has never competed at anything close to the level before. 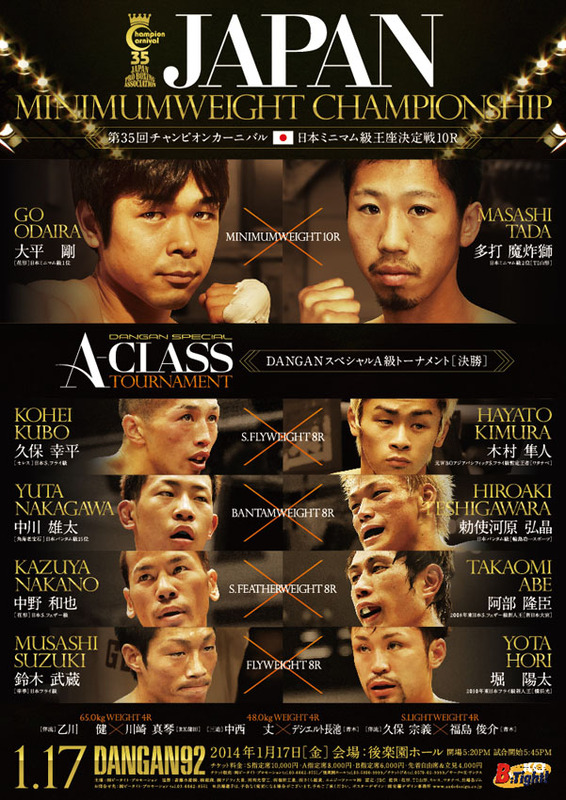 A new week kicks off in style on Monday with two Japanese title fights. We'll admit last week was a bit rubbish in terms of fights but with this week kicking off like this we can only expect a great week from start to end. The show, which features 7 bouts in total, begins with a trio of low level match ups before we move on to a series of very good fights. In the first of those top match ups will see the #1 ranked OPBF Bantamweight challenger Monico Laurente (24-10, 5) attempting to defend his ranking against Japan's hard hitting Yuta Nakagawa (12-4-1, 8). Although Laurente has lost 3 of his last 5, including defeats to Shun Kubo and Tomoki Kameda, he is still a worthy fighter to be highly ranked and Nakagawa will under-stand that he's in with a tough and determined foe. Unranked himself Nakagawa has a lot to gain here and not much to lose so we expect him to give a great effort. Following the Laurente/Nakagawa bout we then get another interesting bout around the Bantamweight division as former OPBF champion Hiroki Shiino (10-3, 9) takes on Filipino journeyman Rodel Tejares (20-28-9, 5). On paper this may not look like much of a fight but Tejares is tough and Shiino is trying to come back from a stoppage loss to Ryosuke Iwasa last December. Shiino has the power to be fun but we do wonder whether he has much of a long term future in the sport. The first of the two main events will see Japanese Minimumweight champion Go Odaira (9-3-3, 1) defending his belt for the first time as he fights Yuma Iwahashi (11-6-1, 1). We tend to feel that Odaira has everything he needs to see off Iwahashi who has never really impressed us. Odaira looked great in his title win earlier this year as he showed off great movement and fantastic speed and we expect to see the same here. After the Minimumweight title fight we then move through the weights as Japanese Super Featherweight champion Rikki Naito (9-0, 5) makes the first defence of his title. Naito, one of the most promising prospects in Japan right now, will be tackling the experienced Kyohei Tamakoshi (32-8-6, 12) who will likely know that anything but a win could end his career. Tamakoshi will need to find the form that saw him defeating Dante Jardon back in 2011 though we're unsure if he will ever secure another win as meaningful as that one. Although this week hasn't been a great one for fight fans it does end on a high with a great Friday which features 2 major title fights in different countries. In regards to the biggest fight of the day we actually feel it's in Bangkok as the unbeaten Teerachai Kratingdaenggym (23-0, 17) defends his PABA Welterweight super title against Mexican foe Fernando Castaneda (21-7, 14). We've no idea how this has been sanctioned as a PABA title fight though it should prove to be a decent test for Teerachai who probably needs a better test before moving much further with his career. Castaneda, a former interim world title challenger, is the best opponent Teerachai has faced though we feel that the Thai should remain undefeated. This card, which will be televised on Thai Channel 7 is expected to have other bouts, though unfortunately we're not sure on what those bouts will be. Although the biggest fight is in Thailand we think the best fight is actually in Japan on "Dangan 92" as we get a Japanese title fight and a further 6 contests. The main event, a bout for the vacant Japanese Minimumweight title, will see Go Odaira (8-3-3, 1) tackling Masashi Tada (11-3-1, 7) in what looks like a genuine 50-50 contest. If Odaira can take the power of Tada then we swing towards him, though with Tada having genuine power at both Minimumweight and Light Flyweight he certainly has a big enough dig on his to make things very interesting. Whilst the main event is the stand out contest we've got to admit we're just as excited about the co-feature which sees Kohei Kubo (16-4-1, 11) fighting Hayato Kimura (20-5, 15) in what is potentially a firefight between two hard punching fighter who can both be hurt. Although boxrec currently lists a bout between Hiroaki Teshigawara (8-1-1, 4) and Yuta Nakagawa (11-4-1, 7), a bout that is also shown n the poster, this contest is actually off, unfortunately. As a result the scheduled 8 bouts have been cut down to just 7.